Nothing says as much as a heart shaped arrangement of 99 Red Roses with Berries and a customized heart shaped Valentine Card for your sweetheart. 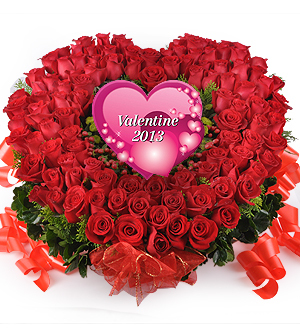 Your personalized Valentine's Message will be custom print on the heart shaped Valentine Card. Kindly indicate in the 'Special Instruction' column should you wish to change the colours of the Roses.